On Saturday morning, we lost our wonderful little Storm. He would have been 17 in January. Storm brought joy and laughter to so many people, not only us. He was the favorite of all visiting therapy dogs, for 9 years, taught children how to behave around dogs and made them laugh with his favorite toy, "the rat" and sniffing each ones' feet. 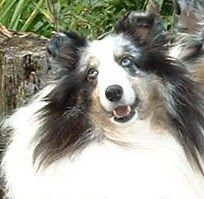 A beautiful sheltie, with two blue eyes, he caught everyones' attention. He was a ham in the obedience ring with an "I'm smarter than you are" attitude. And he was! After his second leg in "Open" competition, he knew in training he could be perfect, but in a trial could refuse an exercise and get attention. Storm loved the camera, and enjoyed wearing party hats to have his picture taken. He was the boss of the house, never doing anything to be top dog, the others just somehow respected him. We always called him "annoying" - he was just too cute and funny to ever get truly annoyed with. He loved his walks through the woods with the big dogs until the last couple of years. With the hundreds of pictures I have of him, I've always loved this one. He will live forever in our hearts, and his breeders', Jo Ann and Terry Pavey. Jo Anns' favorite memory of Storm is watching him play with and whack his wind-up frog. He was quite the guy. CH Fairisles Whitegates Powerline CD CGC St. John Ambulance Therapy Dog (extraordinaire).